JACKSON, Miss. (Reuters) - A white Republican senator's casual reference to a "public hanging" has invigorated a special election runoff in Mississippi, fueling Democratic hopes of an upset in a conservative state with an ugly history of racist violence. Espy, 64, is a heavy underdog in the Deep South state, which has not elected a Democrat to the Senate since 1982. But his campaign got a jolt of adrenaline when a video surfaced a week ago showing Hyde-Smith, 59, praising a supporter by saying: "If he invited me to a public hanging, I'd be on the front row." Advocacy groups conducting a voter turnout drive aimed primarily at African-Americans, who make up 38 percent of the state's residents, said their efforts had gained new urgency. "If people recognize the importance of this moment, there is an opportunity for Secretary Espy to win this race," said Chokwe Antar Lumumba, the black Democratic mayor of Jackson, the state's largest city. "If we can show progress in a state with such historic suffering, then what does it say about the future?" Hyde-Smith, a former state legislator appointed in April to replace retiring Senator Thad Cochran, released a statement calling the Nov. 2 comment "an exaggerated expression of regard" for a friend. She refused to apologize and has not addressed the remarks further. Retail giant Walmart, medical device maker Boston Scientific and railroad Union Pacific made public requests this week for Hyde-Smith to return their donations because of the remarks. Her campaign declined to comment. Walmart said on Twitter on Tuesday that Hyde-Smith's comments "clearly do not reflect the values of our company and associates." Espy would be the first black senator from Mississippi since shortly after the Civil War. He told reporters Hyde-Smith's "disappointing, hurtful" remarks perpetuated stereotypes Mississippi was striving to overcome. "There was already a high level of engagement but her comments took everything up to a whole new level," said Cassandra Welchlin, co-director of the Mississippi Black Women's Roundtable, one of at least two dozen advocacy groups involved in turnout efforts. Welchlin's group is partnering with childcare centers, churches and sororities to target infrequent black women voters. Other groups are focusing on registered black voters who did not participate in the Nov. 6 election, using phone banks, texting parties and ride-shares to get them out. At a weekend breakfast in Jackson, Espy told black women leaders that Jones was elected because women turned out to support him. "What that did for Doug Jones in Alabama, you have to do for me in Mississippi," he said. The runoff to serve the last two years of Cochran's term was needed because no candidate gained more than 50 percent of the vote in a Nov. 6 special election. 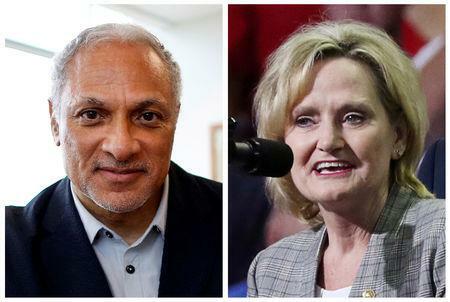 Hyde-Smith and Espy, who nearly deadlocked at about 41 percent, will meet in a debate on Tuesday night. "This is a race that has national importance," Harris said at the Jackson breakfast, saying the outcome would "make a point about who we are as a country, symbolized by the state of Mississippi." "This race is a conservative versus a liberal and Mississippi is a conservative state," said Melissa Scallan, a spokeswoman for Hyde-Smith. She declined to comment on the hanging remarks. Hyde-Smith became embroiled in another controversy last week when a video surfaced in which she seemed to endorse the voter suppression of liberal students as "a great idea." In a statement, Hyde-Smith's campaign said she was joking. The wild card in the runoff will be how many supporters of Republican Chris McDaniel, a hard-line conservative who captured 16.5 percent of the vote on Nov. 6, stay home or back Espy instead of Hyde-Smith. "She isn't the best choice possible but of the two that are left we need a Republican in the seat," Marx said.